If you’ve just set up a business, you’ll appreciate the many considerations on route to getting things up and running. Understandably, the cleanliness of your air ducts is easy to neglect, but staff-well being should be a number one priority. A prosperous business should preference creating a safe breathing environment for its staff, which can be achieved with regular air duct cleanings. 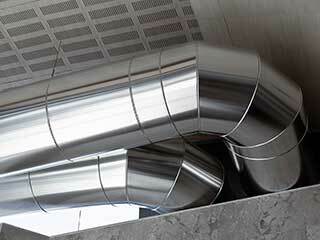 If you neglect the importance of maintaining your air ducts, chemicals, debris, and toxins can circulate. This can make people feel sick, and from an all-encompassing perspective, impact productivity. If you’re wondering why you should consider regular cleanings, read on to discover some great incentives which will make you think twice about not capitalizing on professional help! Mold can cultivate in environments that are subject to condensation, especially when there are regular temperature changes. When mold grows in and around your air duct, employees can fall victim to distressed breathing and coughing. If things are left too long, people can become ill. If this isn’t enough reason to hire a professional air duct cleaner, your priorities are misconstrued. Remember, air ducts can disperse hidden mold spores, meaning it’s essential to get your air ducts regularly inspected. A professional will remove the mold in your air ducts, while implementing a new seal to prevent recurrences. Why Do I Keep Sneezing? Seasonal allergies can affect the quality of work completed by employees at your organization. It’s important to safeguard against anything that aggravates allergies, where sick staff members can negatively influence business operations. A productive environment is a sneeze-free zone, and unfortunately allergies can be awoken when air ducts aren’t properly maintained. Pollen and dust particles can get caught up in air ducts, so should be removed accordingly. When sanitized, your air ducts will create a safe work environment. Yuck, What’s That in My Vents? Many elements can create troublesome odors, especially dust, waste particles, and dirt. You’ll improve air quality tenfold with regular cleanings, which break down the molecules responsible for creating bad smells. Employee satisfaction will improve, and you’ll get rid of any bug debris or dead creatures looming. Thanks for reading this article. Hopefully we’ve brought your attention to some key motivations for getting your air ducts clean. A clean business is the perfect foundation for a productive business.